Argus How To Please Photographer Ad 1952 This is a November 4, 1952 advertisement. It is a nice black and white ad from Argus Cameras Inc of Ann Arbor Michigan. Pictures the Argus C3 including case and flash and it reads, ""How to please a photographer in to easy lessons."" In excellent condition. Photo is taken through plastic and may show wrinkles or crookedness that is not in the ad. This magazine tear sheet measures 5 3/8"" wide by 13 1/4"" tall. 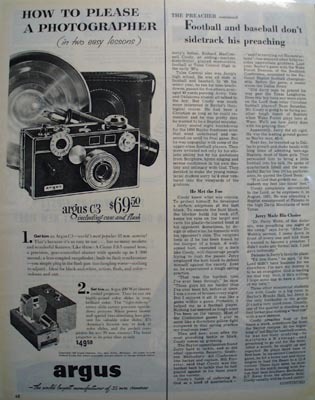 Items Similar To "Argus How To Please Photographer Ad 1952"